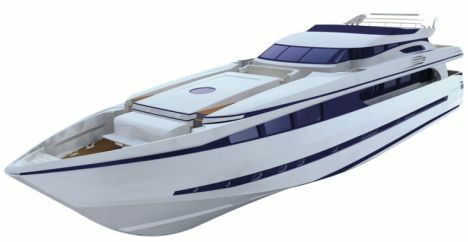 The Admiral 40 is the new motor yacht proposed by the Cantieri Navali di Lavagna, equipped with planing hull and the upper works in light aluminium 5083 alloy. This material, unlike fibreglass, enables each single detail to be modified to the client's requests without the need for moulds and models. The use of a strong alloy resistant to all kinds of vibrations has meant that the yard could give this boat a double bottom hull, with the water and fuel tanks in the lower part. In this way the Admiral 40's centre of gravity is lowered, guaranteeing high stability and seaworthiness. The Cantieri Navali di Lavagna entrusted design of the new motor yacht to the architect Luca Dini, who was responsible for the external and internal lines while Andrea Bacigalupo designed the bottom and the propellers. The design of Admiral 40 has three decks plus a sun deck. The sleeping area for guests and crew is located on the lower deck where there are four cabins, of which two with twin beds and two double beds for the guests, served by the same number of bathrooms. The crew's quarters are in the bows, comprising four cabins, all with private bathroom and a leisure area with dinette seating 12, galley, laundry and storeroom complete with refrigerated cell. The Admiral 40 features three hatches in her stern, two side ones for access to the garage with its tender and jet skis and a rear one that can be lowered to be used as a sun deck, equipped with internal area furnished with sunbeds, armchairs and its own bathroom. The main deck has full beam bow, enabling best use to made of the whole width of the structure for the interiors. This zone houses the owner's private area, including a roomy cabin with double bed, small lounge for office use or relaxation and a bathroom with Jacuzzi tub, shower and separate toilet and washbasin. Amidships there is the lounge with its cocktail cabinet and a lift for access to the storeroom, astern of which is the dining area. On this deck we also find a service bathroom with toilet and washbasin. On the upper deck there is the control station, with all the necessary navigation instrumentation, giving access to the master's cabin, this too with private bathroom. Astern of the bridge is a leisure area furnished with sofas, card table and corner bar linked to the storeroom via a lift. On the same deck outside we find two areas reserved for open air activity, the first is the terrace over the sea with L-shaped sofas and coffee tables, dining area with table for twelve and bar in the bulkhead, while the second one is in the bows and has a dinette with C-shaped sofa and round table. The sun deck is completely given over to relaxation and has sunbeds, Jacuzzi tub with cushioned headrests and a cocktail cabinet with lift. The Cantieri Navali di Lavagna have equipped the Admiral 40 with two 3,050 HP MTU 16V 396 TE94 engines, capable of reaching an official maximum speed of 26 knots. For further information: Cantieri Navali di Lavagna: via dei Devoto 197; 16033 Lavagna (GE) Italia; tel. +39 0185 300341; +39 0185 306601; website www.cnl.it; e-mail info@cnladmiral.com.